Achilles & the tortoise - 8. Is space quantized? Men have long wondered if matter is infinitely divisible. For example, can you keep halving a piece of wood forever to obtain ever tinier pieces of wood? Nowadays, we know that the answer is no. Matter is atomic in nature and not infinitely divisible. Thus, when Zeno edges his points ever closer to the doorway, he tacitly assumes that the distance between a point and the doorway may be as small as one likes. This is to assume that space is infinitely divisible. But if space, like matter, is atomic in nature, there will actually be a smallest distance beyond which we can divide space no further, as it were. And so there will be a limit to how close Zeno’s points can approach the doorway, meaning that his sequence of points must eventually come to a halt! 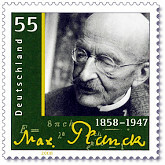 Thus, the “Planck length,” named after the German physicist Max Planck, is supposed to be the smallest quantum of length permitted by nature, so far as physicists know. The underlying physics does not matter here (it has nothing to do with a tortoise), but the Planck length is about 1.6 × 10-35 m, which is a miniscule distance indeed. Roughly speaking, it stands to an atom as an atom stands to the sun! Let’s work with this number and see what happens. Consider our table from before, where some relevant lines have been added. Notice that once Achilles reaches point 117, his distance to the doorway has become shorter than the Planck length. But if the physicists are right, this distance is too short to be of spatial significance. This means that we cannot regard point 117 and the doorway as being two separate locations. Given the atomic nature of space, these locations must be regarded as being one and the same. So the last point that Zeno can really lay down is point 116. And once Achilles reaches it, his next motion takes him to the doorway because there is no other location “in between” for him to occupy. This sounds incredible, but if space is quantized, that is how it is. Now, on the solution being considered, space must be quantized in this way because, as explained previously, Zeno’s sequence must contain a last point if Achilles is to “escape” to the doorway, and quantizing space seems to be the only way to ensure this. So even if the physicists had not yet discovered it, Zeno’s paradox already reveals the atomic nature of space. Likewise, no pie can be infinitely sliced in the manner shown before because, beyond a certain point, the slices will be too thin to be spatially distinguishable and no further “slicing” can meaningfully occur. This diagnosis, if correct, would be truly remarkable. It’s one thing to believe that space is quantized on detailed experimental grounds (like modern physicists), but quite another to deduce it simply by reflecting on whether a man can reach a doorway! Does Zeno’s paradox really show that space must be quantized in this way? Well, it really depends on the considerations of the previous section. In particular, is it really true that Achilles cannot reach the doorway unless Zeno’s sequence contains a last point for him to cross? To answer this question, we must sharpen those considerations a little further. And we can do this by considering an unusual device known as Thomson’s lamp.